One of a number of edible oils believed to be beneficial to your health, safflower oil does come along with certain risks. This article will try to inform you as fully as possible on its potential benefits and its negative effects. With any luck, you will be able to make a more informed decision and way up the benefits against the potential risks. The safflower plant is native to much of Asia, Africa and the Middle East. In India, it is known as kusum while in China it is called hongua. It is among the world’s oldest cultivated crops with a history dating back some 4,000 years to ancient Egypt. However, it was not until the middle of the last century that safflower plant production went into full swing. Wet and then comb your hair thoroughly. Put two or three drops of your safflower oil on your hands and rub your palms together. Massage the oil into your hair and scalp using a comb to cover your hair evenly. Wait for about an hour then rinse it out thoroughly with your regular shampoo. Repeat this hair treatment once or twice every week and you should notice an improvement in your hair’s health and appearance. safflower oil is also a good natural moisturizer because it seals the moisture inside the skin keeping your skin properly hydrated and glowing. It can help soften dry areas of skin and rough patches improving the tone and texture of your skin. You can either use your safflower oil alone or combine it with another skin friendly oil like jojoba or grape seed oil. Put the oil or oils in a bottle then store it in the refrigerator which will stop your oil from going rancid. Safflower oil tends to turn rancid because it contains unsaturated fatty acid. First of all, use clean, warm water to wash your face. Next, massage the oils into your skin but be careful not to get any in your eyes. Pay special attention to areas of your face that are dry and add a few extra drops if necessary. safflower oil also has anti-inflammatory properties so you can massage a little into areas of your face and body that are swollen or sore. Safflower oil may also help relieve headaches or migraines because of its soothing anti-inflammatory properties. If you have a headache, simply massage a little of the oil into your temples and you will hopefully find some fairly quick relief. Of course, if you have a more serious or persistent headache, you should consult a doctor to make sure that it is not a symptom of a more serious health condition. Is safflower oil good or bad for you? Safflower oil is rich in good fats or unsaturated fatty acids. It is far healthier than most oils and nearly on a par with canola and olive oil. There are plenty of health benefits to using safflower oil but there are some drawbacks. Like most oils, it is very high in calories but not especially high in valuable nutrients. While it is not the healthiest food, it is a great alternative to more popular refined oils. What are the health benefits of safflower oil? Safflower oil has a wide variety of potential health benefits. It can help reduce cholesterol levels, lower blood sugar levels and may aid weight loss. It also has anti-inflammatory properties and the ability to treat muscle pain or joint issues like arthritis. Safflower oil can also be applied topically to the skin to improve its health and also to your hair. What is the difference between safflower and saffron? Some people confuse saffron and safflower because their names sound similar. However, safflower is mainly used for its healthy oil and used for cooking. Saffron is a very valuable and highly prized stigma taken from the crocus plant and also used as a cooking ingredient. An oil is also made with saffron but it is not usually used in cooking. What does safflower oil do for the skin? Safflower oil has anti-inflammatory and antioxidant properties that are great for the skin. Because it is a great source of linoleic acid, it can help treat acne when applied topically. 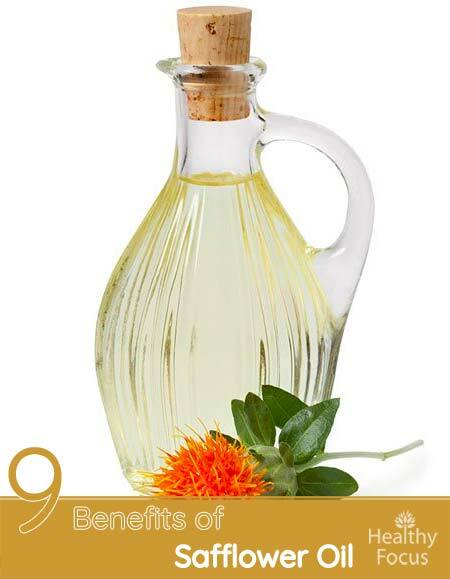 Safflower oil can also help keep your skin moist, supple and attractive. Safflower oil is a great option if you are looking for a healthy cooking oil to replace your usual refined oil. It contains plenty of healthy unsaturated fatty acids like linoleic acid. Safflower oil comes with a wide range of health benefits including heart health, blood sugar management and may even help you lose some weight. It also has anti-inflammatory properties that can help relieve muscle pain and the symptoms of arthritis. If you are on the look out for a good quality oil, why not give safflower oil a go. If you have already made the switch, please let us know what you think of it.